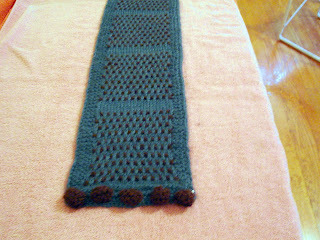 Last year (2006) I made 15 scarves to give as Christmas presents. I got the idea when I bought a red chenille scarf on sale at Marshalls in the new year. I thought two things: 1) this scarf would be so easy to make make; and 2) this would look good on Peggy. Yes, Peggy would have looked great in a red scarf, but as it happened I decided to make scarves for everyone I knew, each one different, and to simplify the choices I went with the color blue. I figured that everyone looks good in and likes one or another shade of blue. I apologize for the quality of my photos. I can see that I'll have to learn to take better photos in order to effectively blog knitting. I would appreciate any advice you may have about this. blocked size: 7" x 55"
This was my first use of hand-dyed yarn. I got it online from an eBay seller named kimiK who sells a lot of beautiful sock yarn at reasonable prices. I loved the yarn even though it pooled in the knitting. That didn't bother me. It also bled and smelled. The smell was pretty, but it creeped me out a little. Pattern for this scarf here. blocked size 6.5" x 52"
adapted basket weave stitch from Mon Tricot with blue and green trim (garter stitch) with green being a few yards of Brown Sheep Lamb's Pride. This was my absolute favorite of all the scarves. First, the Cash Iroha was so beautiful: glossy and heavy in a good way, smooth and soft. This picture really does not do it justice. It had a little Scottish look about it with the blue and green colors and the short fringe along one long side. In fact, I ordered yarn to knit it again for myself, which I will do someday. The original yarn came from Woolneedlework in Canada; the second from Janette's Rare Yarns, an eBay store in the UK. blocked size 7" x 63"
This was for the lady who would have looked good in red chenille. A far cry from red, but the blue is much brighter and prettier than it looks here. The yarn came from a local yarn store. blocked size 6" x 55"
This yarn was from (I think) Woolneedlework. I used my favorite basket weave pattern with a long-side fringe idea taken from Nickie Epstein's Knitting on the Edge, Saxon Braid Scarf. The fringe consists of a plain stockinette border at the edge of the pattern work. 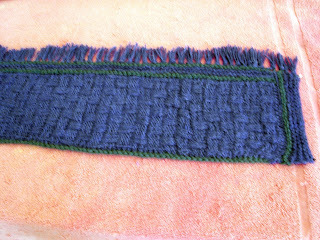 The stitches of the border are unraveled to make a fringe loop, It didn't make sense to me until I did it. The Saxon braid itself is spectacular and I might knit it sometime. The yarn color is actually a soft duck egg blue, and it is a soft, soft yarn. It was actually a color mistake purchased for a different scarf to use with a chocolate brown of the same yarn. They did not look as good together as I expected them to, at least in the design I used. Marilyn, however, turned out to be a glamorous scarf. blocked to 6.75" x 58"
with smaller stockinette sections and a garter edge. I made a row of five knitted bobbles to finish each end. This design is one of the most original. However, it is heavy and tends to curl. I grew to like it.